A regular breeding resident and migrant in Minnesota. The Black‑throated Green Warbler was a common species during the Minnesota Breeding Bird Atlas (MNBBA). Primarily found in northeastern and upper midwestern portions of the United States and Canada, especially from Labrador to northern Alberta and south in the Appalachian Mountains to Alabama. The highest densities are found in the Upper Peninsula of Michigan, Labrador, and Nova Scotia (Figure 1). Long-distance migrant, overwintering in the Caribbean, Central America, and northern South America. Insects, gleaned from foliage, especially caterpillars on conifers. Cup-nest usually in conifers; often low but at variable heights. Breeding distribution and relative abundance of the Black-throated Green Warbler in North America based on the federal Breeding Bird Survey from 2011 to 2015 (Sauer et al. 2017). Historically, the Black-throated Green Warbler was described by Roberts (1932) in the northern coniferous forests from northern Isanti County and west to Itasca State Park. He also described the species as formerly “a summer resident in considerable numbers in the heavy deciduous forest (‘Big Woods’) of Wright County in 1875.” Occasional pairs were found in the early 1930s in the heavy forests south of the coniferous region and in limited numbers around Lake Minnetonka in Hennepin County. He reported nesting behavior from only two areas. These included two from Mille Lacs, both with “young first seen out of the nest” and “feeding young out of the nest.” The other was a nest with four eggs in Itasca State Park, where the young left the nest on July 13. Green and Janssen (1975) outlined a similar breeding distribution of northeastern and north-central regions and added confirmed nesting from Cook and Lake Counties, plus inferred nesting from Hubbard County. Janssen (1987) provided a similar distribution but cited observations south to northern Anoka County at Cedar Creek and as far west as Tamarac National Wildlife Refuge in Becker County. He noted confirmed nesting in 5 counties since 1970, including Beltrami, Clearwater, Cook, Crow Wing, and Lake, plus he emphasized its distribution in the northwestern region of the state was unclear. By 1998, Hertzel and Janssen added the species to the list of confirmed nesting in Aitkin County since 1970. The Minnesota Biological Survey (MBS) identified 881 breeding season locations of the Black-throated Green Warbler (Minnesota Department of Natural Resources 2016). The distribution of these locations emphasized the primary breeding distribution in the northeastern and north-central forests. However, the MBS included several breeding season detections from northwestern Minnesota, including Roseau County and eastern Marshall County, west to Mahnomen and Becker Counties, and southwest to Douglas and Todd Counties. The MNBBA included 1,741 records and reinforced the breeding distributions identified by the MBS. Nearly all of the records were from the Laurentian Mixed Forest Province but included scattered observations from the Tallgrass Aspen Parklands and from the extreme northern portion of the Eastern Broadleaf Forest Province (Figure 2). Nesting was confirmed in 35 blocks (<1% of all blocks) and in only 4.4% (35/795) of the blocks where the species was observed (Figure 3; Table 1). Additional counties with confirmed nesting from the MNBBA and not previously included in Hertzel and Janssen (1998) included Carlton, Cass, Itasca, and St. Louis Counties. The MNBBA also identified probable nesting in Becker, Koochiching, Lake of the Woods, and Roseau Counties, plus possible nesting from Marshall County and in southeastern Pine County. The probability map indicated the species’ wide distribution in the northeastern and north-central regions with especially high concentrations predicted in Cook and southeastern Lake Counties. Higher densities were also predicted in several patches further west and south including in portions of Beltrami, Carlton, Cass, Clearwater, Hubbard, Itasca, and Koochiching Counties (Figure 4). Roberts’s (1932) reports of the Black-throated Green Warbler in the Big Woods Subsection in the late 1800s suggested the species’ range had contracted substantially with the opening of the forests for agriculture and urbanization. Cutright et al. (2006) in Wisconsin supported this observation and stated that the species was likely found throughout the state prior to the clearing of forests during the 1800s. However, Cutright et al. found confirmed nesting in several places in central and southern Wisconsin during their breeding bird atlas, especially where large tracts of mature forest can still be found. Chartier et al. (2013) reported that even though suitable habitat in the southeastern Lower Peninsula of Michigan is dispersed and fragmented, the Black-throated Green Warbler has rapidly expanded into the southern regions of the state. They reported a 16% increase of townships where the species was reported in the Lower Peninsula over the twenty-year period between the first and second Michigan breeding bird atlases in the early 1980s to the early 2000s. In their review of the Black-throated Green Warbler in North America, Morse and Poole (2005) suggested the species may have expanded its range westward in recent years in Canada but state the farthest northwestern breeding detections in the United States occurred in northwestern Minnesota. Morse and Poole also report an unusual disjunct breeding population that was found in the Ozarks and a recent expansion into the Ouachita Mountains of northwestern and west-central Arkansas. Breeding distribution of the Black-throated Green Warbler in Minnesota based on the Breeding Bird Atlas (2009 – 2013). Summary statistics of observations by breeding status category for the Black-throated Green Warbler in Minnesota based on all blocks (each 5 km x 5 km) surveyed during the Breeding Bird Atlas (2009-2013). Summary statistics for the Black-throated Green Warbler observations by breeding status category for all blocks and priority blocks (each 5 km x 5 km) surveyed during the Minnesota Breeding Bird Atlas (2009-2013). Predicted breeding distribution (pairs per 40 hectares) of Black-throated Green Warbler in Minnesota based on habitat, landscape context, and climate data gathered during the Minnesota Breeding Bird Atlas (2009-2013) using the General Linear Modeling method with an adjustment for detectability. Collins (1983) described the Black-throated Green Warbler as a characteristic inhabitant of the boreal coniferous forest and the transitional forests between coniferous and deciduous forests. The species was widely distributed in these types of transitional forested areas, according to the probability map (Figure 4), which shows the species in areas of mixed coniferous-deciduous forests. However, the highest concentrations of the species were identified in areas with greater proportions of coniferous trees. This is especially true where upland conifers such as balsam fir, pine (white and red pine), and white spruce are found (Figure 5). The Black-throated Green Warbler was found sparingly in jack pine in Minnesota’s National Forests (Niemi et al. 2016). Bednar et al. (2016) only found the Black-throated Green Warbler to be common in mixed swamp conifer forests (primarily white cedar, ash, and balsam fir), and it avoided forested areas dominated by black spruce and tamarack in the Agassiz Lowlands Subsection. Morse and Poole (2005) also emphasized its use of white-cedar forests in the eastern and southeastern United States. Its general avoidance of lowland coniferous forest comprised of black spruce and tamarack and uplands with jack pine was consistent with reports from areas as widespread as western Canada (Hobson and Bayne 2000) to northern Maine (Morse 1978). Results from the MNBBA emphasized the species’ extensive use of a wide variety of coniferous-associated habitats, including pine forests, upland coniferous forests, and northern mixed deciduous-coniferous forests (Figure 6). The National Forest Bird (NFB) Monitoring program in the Chippewa and Superior National Forests noted the species’ preferences for aspen-spruce-fir, mature red pine and white pine, mature mixed swamp conifers that include white cedar, and mixed upland hardwood forests (Niemi et al. 2016). In Wisconsin, it was highly associated with hemlock, northern hardwood (e.g., beech, maple, and basswood), and pine forests (Robbins 1991; Cutright et al. 2006; Niemi et al. 2016). The species has been extensively documented as sensitive to forest patch size (Morse and Poole 2005; Cutright et al. 2006). Hobson and Bayne (2000) in Canada documented the species’ disappearance from small forest fragments. Hannon and Schmiegelow (2002) also suggested that corridors between patches of forest were not effective in increasing populations between patches. In one of the few studies in Minnesota, Grinde (2015), however, found no relationship in the local colonization or extinction of the Black-throated Green Warbler with patch size or edge characteristics in northern Minnesota. Typical breeding habitat of the Black-throated Green Warbler (© Gerald J. Niemi). Habitat profile for the Black-throated Green Warbler based on habitats within 200 m of point counts where the species was present during the Minnesota Breeding Bird Atlas (2009-2013). Partners in Flight (Rosenberg et al. 2016) estimated a breeding population of 8.7 million breeding adults in North America and about 300,000 in Minnesota (3.5% of the global population) (Partners in Flight Science Committee 2013). The MNBBA, however, estimated a much larger population of the Black-throated Green Warbler in Minnesota, 1.43 million breeding adults (95% confidence interval of 1.26 to 1.94 million). This latter estimate would indicate that more than 18% of the species’ North American breeding population is found in Minnesota; however, these widely different estimates may be due to differences in methodology and abundance data used in the models. The higher estimate by the MNBBA may be due to better coverage of roadless areas in the Boundary Waters Canoe Area Wilderness, where the species is prominent. Partners in Flight uses roadside counts from the federal Breeding Bird Survey (BBS) (Sauer et al. 2017) and, therefore, did not sample these roadless areas for inclusion in their models. The BBS trend estimates for the species in Minnesota was non-significant from 1967 to 2015 which indicated a stable population (Figure 7). The Minnesota trend is consistent with the province of Ontario but inconsistent with both Michigan and Wisconsin, where trends were significantly increasing by 2.15% per year and 1.56% per year, respectively, over the same time period. In contrast, Manitoba had a significantly declining population of 2.68% per year from 1967 to 2015. Survey-wide, the trend is also stable in North America for the Black-throated Green Warbler. Partners in Flight (Rosenberg et al. 2016) estimated a 41% increase in the breeding population from 1970 to 2014. The NFB program in Minnesota detected a significantly increasing population in both the Chippewa (2.27% per year) and Superior (1.54% per year) National Forests from 1995 to 2016 (Figure 8). The overall regional trend was significant at 1.87% per year, which was based on a relatively large annual sample size of 170 forest stands. Overall mean population densities in the Chippewa and Superior National Forests were similar and estimated at 4.8 pairs per 40 ha based on point counts (Niemi et al. 2016). Within specific habitats where the species commonly occurs, mean densities in the Chippewa National Forest ranged from 4.8 pairs per 40 ha in lowland hardwood and mixed swamp conifer forest cover types to 12.9 pairs per 40 ha in mixed upland hardwoods and 16.1 pairs per 40 ha in mixed aspen-spruce-fir cover types. In contrast, in the Superior National Forest, mean densities tended to be low in mature red pine cover types with estimates of 3.2 pairs per 40 ha but much higher in mixed swamp conifer and mixed upland hardwoods, ranging from 11.3 per 40 ha and 12.9 pairs per 40 ha, respectively. 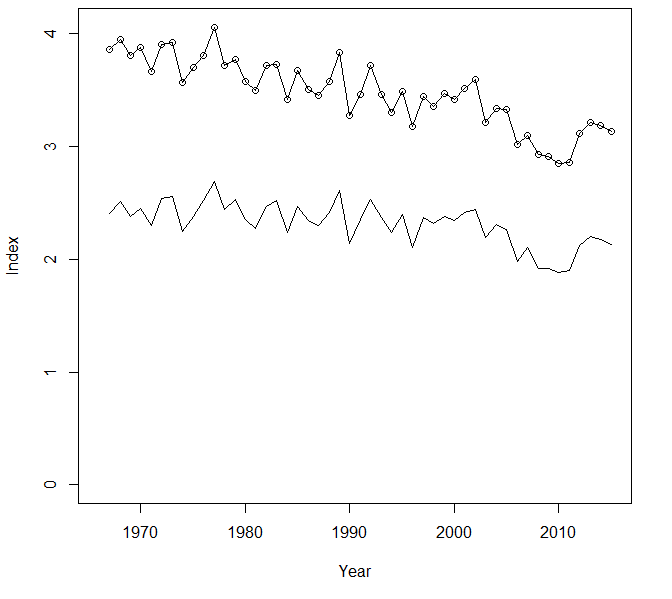 Breeding population trend for the Black-throated Green Warbler in Minnesota for 1967–2015 based on the federal Breeding Bird Survey (Sauer et al 2017). 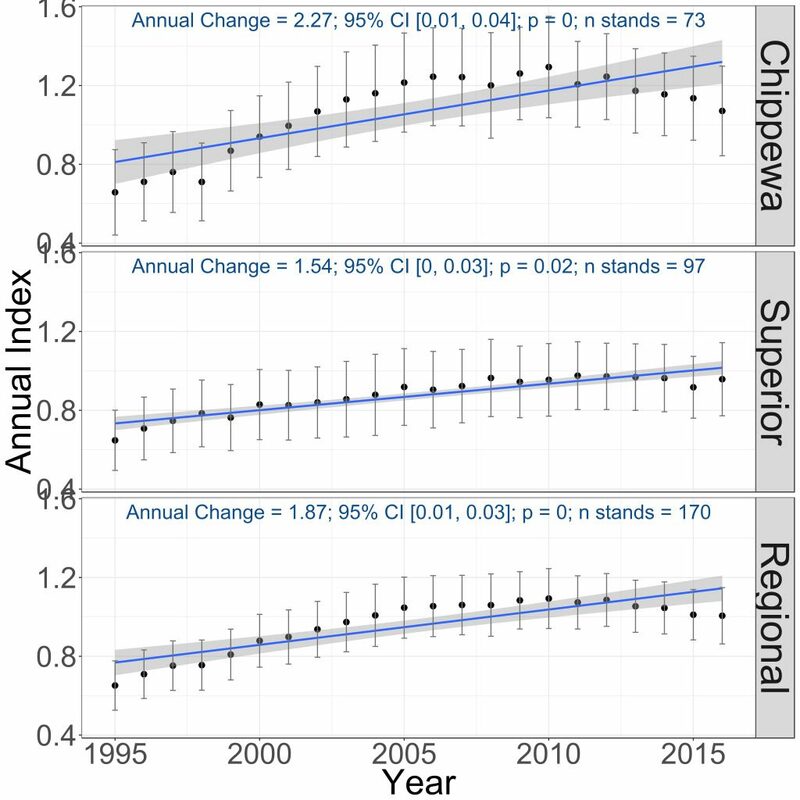 Breeding population trends of the Black-throated Green Warbler in the Chippewa and Superior National Forests and the combined regional trend, 1995–2016 (Bednar et al. 2016). At present there is little concern with this species because of its healthy breeding population in the state and positive or stable population trends throughout a substantial portion of its breeding range. Overall, the Black-throated Green Warblers’ Continental Concern Score of 9/20 substantiates a minimal management approach at the present time (Rosenberg et al. 2016). However, the Black-throated Green Warbler shows a lower affinity for younger forests (<20 years old) (Flaspohler et al. 2002; Niemi et al. 2016), so extensive logging or short-rotation forestry can reduce its overall population (Niemi and Hanowski 1992). Morse and Poole (2005) reported that the species showed population declines in areas sprayed with DDT and with application of fenitrothion in spruce budworm control areas. As with many of the species with northern boreal affinities in their breeding distribution or in high elevations in the Appalachians, the species is considered “climate threatened” by Langham et al. (2015) and the National Audubon Society (2015). The society also predicted that the habitat of the Black-throated Green Warbler will decline in Minnesota and move northward with unknown consequences to its long-distance migrations to wintering areas in the Caribbean and Central and northern South America. Collins, Scott. L. 1983. “Geographic Variation in Habitat Structure of the Black-throated Green Warbler (Dendroica virens).” Auk 100: 382–389. Flaspohler, David J., Casey J. Fisher Hukins, Brian R. Bub, and Peter J. Van Dusen. 2002. “Temporal Patterns in Aquatic and Avian Communities Following Selective Logging in the Upper Great Lakes Region.” Forest Science 48: 339–349. Grinde, Alexis. 2015. “Spatio-temporal Ecology of Forest Birds.” PhD diss., University of Minnesota. Hannon, Susan J., and Fiona K. A. Schmiegelow. 2002. “Corridors May Not Improve the Conservation Value of Small Reserves for Most Boreal Birds.” Ecological Applications 12: 1457–1468. Hobson, Keith A., and Erin Bayne. 2000. “Effects of Forest Fragmentation by Agriculture on Avian Communities in the Southern Boreal Mixedwoods of Western Canada.” Wilson Bulletin 112: 373–387. Morse, Douglass H. 1978. “Populations of Bay-breasted and Cape May Warblers During an Outbreak of the Spruce Budworm.” Wilson Bulletin 90: 404–413.